We're living in trying times. We can split the atom, clone DNA and send images and ideas across the world at the speed of light, but we still haven't learned to live together and hear the cries of our brothers and sisters when they need us the most. Doctors are working hard to cure AIDS and cancer, but no matter how far science advances, there are some things it will never be able to explain. Why do we suffer? How come we still treat each other so bad? No. Science will never mend a broken heart or help us transform despair into hope. Sometimes, faith is the only thing that can carry us from darkness to light, and often music is what illuminates us on that journey. It's during those times that you want to call on The Sojourners. The celebrated Canadian gospel trio's third album, Sing and Never Get Tired produced by Cousin Harley's Paul Pigat offers new hope for people living in desperate times. With its twelve new songs of faith, struggle and the promise of redemption, the music on Sing And Never Get Tired has the power to soothe the hurts brought by modern life. With a more raw and bluesy edge than they've ever shown us before, singers Marcus Mosely, Will Sanders and newcomer Khari McClelland prove that there's still no kind of music that's more stirring, uplifting and inspiring than gospel music when it's done right. 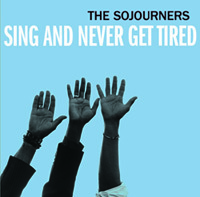 There are lots of sugary, squeaky-clean gospel songs out there for people to listen to, but that's not what you come for when you decide to spend time with The Sojourners. Mosely, Sanders and McClelland perform music that reflects the world we all live in. They don't sing about some removed perfect place or any distant plains of glory. Their music expresses the old adage that God does his best work on the streets and in the gutters and not in the houses of power or the mansions of the rich. According to Mosely, "This album is grittier and has more of an edge than anything we've done before. These new songs have a groove to them. We're doing dance music, and if you come to see us, you should come ready to have a good time." Most importantly, Sing and Never Get Tired explores the roots of the connection between gospel and social action by dipping into the deep well of American roots music to revisit classic songs associated with The Staples Singers, The Dixie Hummingbirds, Rosetta Tharpe and Nina Simone. It's a record that recalls the sixties in both its sound and its subject matter. It records a journey and offers hope of change. Marcus Mosely explains, "A lot of the old themes of my youth are coming back. Look at the news and read about voter suppression, gun control, or Trayvon Martin. It felt like the right time to weigh in on those subjects. We're not preaching, but we want to remind the older generation of where we used to be, and we want to tell younger people that this is their time. It's up to them to decide what kind of world they want. Are they still going to have to spend their lives taking to the streets to protest injustice? Sadly, it's still necessary. Liberty is not a plateau that we reach that is static. If you don't protect it, it can be taken away." It's this kind of commitment to truth and justice that makes the performances on 'Sing and never get tired' so stirring. The Sojourners sing with such soulful immediacy and passion that they truly give new life to songs that we may have heard many times before. Can anyone listen all the way through 'I Shall Be Released' with dry eyes? Has anyone ever heard as provocative a version of 'For What It's Worth' or a take as rousing as this of Woody Guthrie's 'I Ain't Got No Home'? Deep, soulful versions of 'Don't Knock' and 'Why Am I Treated So Bad?' work as heartfelt tributes to Pop Staples and The Staples Singers who first blazed the way for socially conscious gospel music half a century ago. In addition to these, there are rocking takes of Sister Rosetta Tharpe's arrangement of 'This Train' and a gorgeous piano driven version of 'Milky White Way' that recalls The Platters and The Soul Shifters to keep people moving. Sing and Never Get Tired also features two original songs, 'Hiding Place' by Marcus Mosely and 'Dressed for Heaven' by Brandon Isaacs of The Twisters that effortlessly fit into the groove and overall feel of the record. Sing and Never Get Tired is a classic gospel album sung in a soulful, rootsy, bluesy style and with a musical backdrop that recalls the best of sixties gospel and rock music. With its earthy vocals, gorgeous harmonies and effortless swing, it is music with the power to heal and transport. It is music created by men who are living in the same world full of struggle and cares that we all have to endure. Sing and Never Get Tired is an album for our times where the rich still get richer and the poor still get poorer. More than anything else, it's an album of hope that reminds us that no matter how many times we get cheated, lied to and knocked down, faith can move mountains and music can give us the strength to get up, wipe ourselves off and try all over again.